Tony Harris, CEO of Boat International Media, hosted the 19th annual ShowBoats International Awards last Saturday, October 31st and, unsurprisingly, the 90.1m superyacht Nerotook top honours as the Best Motoryacht Over 75 metres. Currently for sale as a joint central agency between Merle Wood & Associates and Burgess, this should add a welcome lustre to her appeal to potential buyers. Built in 2008 to Lloyds class and MCA compliant, she accommodates 12 guests in a master, VIP, two doubles and two twins and carries a crew of 22. 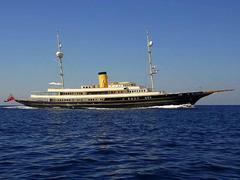 This award-winning superyacht is on the market at €75 million.